The Richmond River from Burns Point to the tips of the sea walls, including North Creek and Emigrant Creek, comprise around 12 square kilometres of recreational fishing. This area encompasses more than 90% of the remaining seagrass beds in the estuary, there is a huge variety of bream, whiting, flathead, jewfish, trevally, blackfish, mangrove jack and tailor living here. The rocky banks behind the CBD from the swimming pool to the mouth of Fishery Creek. Just upstream of the swimming of the swimming pool is the Bream Hole, plunging down to about 9m with a vertical rock shelf on its southern edge. Best catches are from April to September. The Lance Ferris Wharf in Fawcett Park provides excellent catches and is relatively safe for supervised younger anglers. Riverview Park west of the RSL has a boat ramp, sheltered tables, toilets and barbecues. Fishery Creek, on the western fringe of the CBD has the trawler harbour at its mouth and is also the site of the largest and most sheltered ramp on the river. Various Rocky Headlands and beaches north to Cape Byron from Ballina. South of Ballina to Evans Head also provide huge scope for surf anglers chasing jewfish, tailor, bream, dart, whiting, trevally and tuna. Vehicles are permitted on the beach from about a kilometre south of South Ballina, down to Airforce Beach at Evans Head. Vehicles are also permitted along Seven Mile Beach at Lennox Head, north to Broken Head. Access is just past the Sport and Recreation Camp. You will require a permit to drive on this stretch of beach. Permits are available from the automatic kiosk that is located opposite the Lennox Head Surf Club approaching Camp Drewe Road. Payment by Visa, Mastercard or debit card. 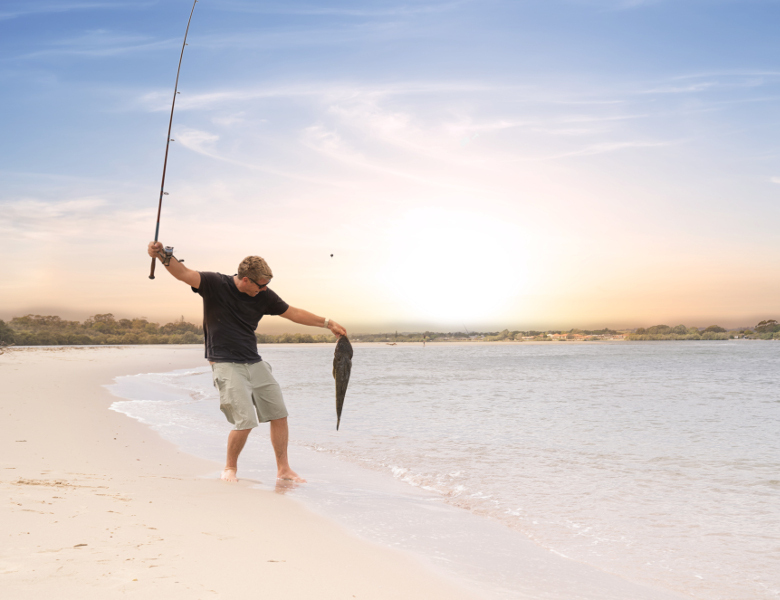 The North and South walls offer the typical sort of breakwall fishing common elsewhere along the NSW coast for bream, tailor, blackfish and jewfish, with the occasional snapper after heavy seas and mackerel and tuna when the tropical current touches the shore. North Wall access is great, you can even take the bicycle path from town, while South Wall is reached by a ride across the Burns Point vehicle ferry. Parking is adequate at both spots except when the surf's up and the fish are on. The deep and fast running narrows at Wardell under the highway bridge are popular for school jewfish, especially on the slack of Summer night tides. Live herring or poddy mullet take plenty of fish, as do soft plastics and hard minnows. You can purchase a fishing licence from any of the following outlets. Please dispose of your fishing lines safely and help protect our wildlife. Ballina Harbour, Regatta Avenue, Eastern side of the harbour, alongside the Richmond River.